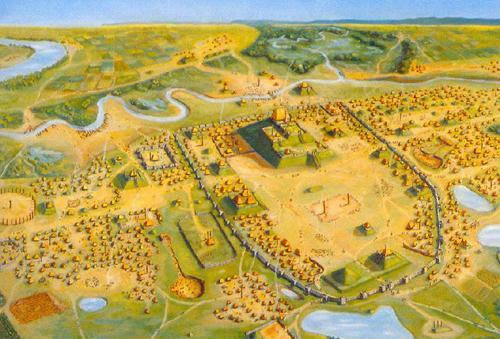 An artist's rendering of the Cahokia Mounds in 1150 A.D.
Photo courtesy Peter ThomsonUniversity of Wisconsin-La Crosse Archeology Field School student Christina Young takes measurements where the remains of a Native American settlement dating back to 1350 was discovered in Wisconsin. The recent discovery of the remains of an Oneota long house has led to the documentation of nearly 7,000 artifacts by a University of Wisconsin-La Cross (UW-L) archaeology class. According to an article on LaCrossTribune.com, similar houses were discovered in the same area in 1987 and 1992 during a road construction project. The most recent find—discovered in a remote field near Highway 53 in Holmen, Wisconsin—is thought to be more than 500 years old. The class is taught by UW-L associate professor David Anderson, who told the Tribune that the remnants from the site haven’t been examined yet, but they should help add to the understanding of what life was like for the Oneota people before European influence. According to the Mississippi Valley Archaeology Center, the Oneota people were the first farmers in what is now Wisconsin, but a report from the University of Iowa says many questions remain about this culture, including the origin of the Oneota. 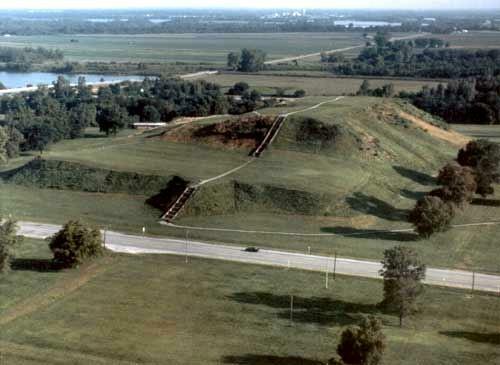 LegendsofAmerica.com says the Cahokia Mounds are the largest archaeological site in North America, covering more than 2,000 acres across the Mississippi River from what is now St. Louis, Missouri. The University of Iowa report goes on to say that some researchers believe Oneota people migrated from Cahokia, others suggest Oneota and Cahokia were entirely different groups, and still others think Oneota culture evolved from indigenous woodland cultures in the Upper Mississippi Valley. There is even not much information on the types of houses the Oneota lived in, because, as the report points out, not many structures have been excavated in Iowa. “Sites elsewhere suggest that the house form was a long rectangle or rectangle with rounded corners,” the report says. 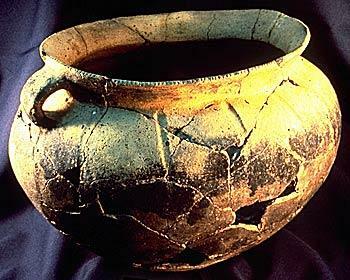 Oneota pots were tempered by adding burned and ground clam shell to the wet clay. One thing researchers do know about the Oneota is their pottery, which were “elliptical, globular-shaped vessels with a rounded base and wide strap or narrow loop handles.” The most distinctive thing about their pottery was the way it was tempered—by adding burned and ground clam shell to the wet clay. Yet another unknown, according to MuseumLink Illinois, is which Native American tribes are the descendants of the Oneota people. Only time will tell if the recent find in Wisconsin can help clear up any of these questions.